WASHAA 6th Annual Meeting is october 5th in Seattle! Join us for the "Conscious Living and Dying: Health Advocacy at End of Life" meeting! Will we see you at our 6th Annual Meeting? This year promises to be our best meeting yet, with the topic: Conscious Living and Dying: Health Advocacy at End of Life. Check our full agenda here (or below), and be sure get your early bird discount (ends Tuesday, September 4th)! Conscious Living & Dying: Health Advocacy at the End of Life**, starting at 9 am - 3 pm, Friday, October 5, 2018 at the UW Center for Urban Horticulture in Seattle, WA. **This meeting is anticipated to be approved for 4.5 CEUs by BPCA, LSW, LMFT, LMHC, Care Managers, CNAs, HCA and Family Caregivers (additional fee of $25 applies for CEUs). Also, don't forget to sign up for our Networking Meeting Sept 12 - Register today and we hope to see you there! Open Enrollment is Coming. Join the Conversation ON OCTOBER 23rd! Visit Concerned about health insurance premium hikes for 2018? Shopping for a new plan? What if the plan will no longer be available in your county, or your doctor no longer participates in the insurer’s network? What happens when a patient is in the midst of complex treatment and insurance ends? When should you use a broker, exchange navigator or insurance advocate? So many changes are happening with health insurance; more will come. Whether plans are directly purchased or obtained through a State-run exchange, it’s important to be aware of rules, deadlines and changes. Prepare for a complicated chapter with tips related to choosing, buying and navigating health insurance. We will be sharing expertise from Karen Vogel and Molly Lanzinger. Karen is a WASHAA member specializing in insurance-related advocacy and Molly is a licensed broker specializing in insurance consulting for small businesses, families and individuals. Drawing upon 5 decades of shared experience, information will be tailored to your interests and concerns. Your thoughts are welcome! Advocates and the general public can send questions and comments to our online mailbox at info@washaa.org or submit questions via a Google Form. Inquiries will be incorporated into a WASHAA-sponsored presentation later this year. With Karen and Molly’s help, WASHAA will attempt to answer your questions to the best of our knowledge. Visit us on Facebook at 2pm (PST) on October 23rd to see your questions answered LIVE! No question is too small or too big! We will do our best to answer! Principal Scientist at Cancer Treatment Navigator, Inc.
​Patient access to investigational cancer drugs is governed by the FDA, via clinical trials and the compassionate use program. The new senate approved bill “Right to Try Act”, provides a third new avenue to patients to secure investigational drug. The pros and cons about the “Right to Try Act” are debated in this Medpage article. Cancer Treatment Navigator (CTN) has intimate perspective on issues faced by cancer patients in accessing investigational therapies. Our personalized services identify treatments not yet considered for cancer patients diagnosed at any stage, after a complete review of their medical history and gene mutation profile. Often, these turn out to be drugs under study in clinical trials, and not available in clinics or hospital formularies. In our experience, patients continue to face difficulty in accessing these drugs because of factors such as physician opinion on when to keep trying and when to give up hope of improving a patient’s condition. Several hopeful patients that make informed choices on wanting to try an investigational therapy end up battling odds when their cancer care team, led by an Oncologist is unaligned on the benefit/risk profile of a drug that is in clinical trials, even though there is ample safety data to warrant its use. One of the patients we served in the past had highly metastatic throat cancer. Scientific and clinical data supported that he might greatly benefit from a drug that is approved for a special form of lymphoma. This specific drug was “investigational” for metastatic throat cancer, yet had been on the market for lymphoma for almost a decade – with thousands of patients treated and a remarkable safety record. Yet, it was the Oncologist’s decision to refuse writing a prescription for this drug, citing concerns about the patient’s safety. The irony of this story was the fact that the Oncologist did sign the paperwork for “Death with Dignity”, but could not honor the wish of the patient to try one last “investigational” option with established safety before giving up. This is one of the cases where CTN wholeheartedly supports a “Right to Try-Law”, with provisions to truly empower patients. We would have worked hard for this patient to secure insurance coverage for this investigational drug or work directly with the manufacturer to gain access to this medicine. Above all, the patient would have been willing to pay for a 2-month supply out of pocket – enough to assess if the drug is providing benefit – and still not too long that the patient and his family would have encountered financial hardship. The only “missing link” to gain access to this investigational drug was the signature of the Oncologist on the prescription. It should be the patient’s decision to try one more time, and not of one individual Oncologist. Oncologists play a pivotal role in providing proven therapies, but often do not have the bandwidth to research and assess numerous investigational drugs or get lost in paperwork and phone calls to try secure coverage of investigational drugs. In its current form, will the “Right to try Act” be able to make a difference? We believe there should be modifications on how to assess safety before it is passed into law, so that Oncologists have to define why they don’t accept an investigational drug’s safety, instead of a mere “yes” and “no” based on comfort level dictating a cancer patients right to try. WASHAA PRESS RELEASE -- National health & patient advocate survey 2016 results in! SEATTLE, WA -- For the second year in a row, the National Health and Patient Advocate Survey measured advocate backgrounds, practices, satisfaction and outlook on the emerging advocate field. Health and Patient Advocates for this survey were considered to be paid professionals helping individuals navigate the health care system. The profession of health and patient advocacy seems to be viable, with the overwhelming majority (68%) of independent and employed advocates making enough money to continue doing the work. Almost all (92%) said they intend to continue doing this work in the foreseeable future. Advocates are highly educated. Although there is no one specific path to a career in advocacy, almost half (48%) have a Master’s Degree. Advocates continue to report being optimistic, with the vast majority (92%) reporting they believe that the advocacy field will grow in the next five years. The vast majority (90%) of advocates are hired independent of the health care system. Medical/Navigational Services were the advocacy service most frequently requested by patients (67% of advocates reported this as the top service they were hired to perform and 97% reported that Medical/Navigational Services were one of their top three requested services). The survey was conducted by representatives of the Washington State Health Advocacy Association (WASHAA) and the Alliance of Professional Health Advocates (APHA) in order to begin measuring the backgrounds of advocates, some of their work practices and their outlook on the field. For a copy of the entire survey, please go to: www.advocacycoalition.org. 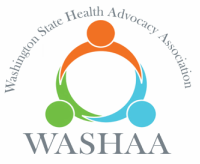 The Washington State Health Advocacy Association (WASHAA) is a non-profit organization dedicated to helping people transform from patients to full participants in their health. WASHAA fulfills our mission by: 1. Raising awareness about health advocacy 2. Teaching health advocacy skills and 3. Connecting people to local, relevant health advocacy resources. For more information visit us at www.washaa.org. We can’t do it without you - consider joining as a ‘Associate (Supporter) Member’ http://www.washaa.org/become-a-member.html to help our organization grow and never miss a WASHAA update. With the holidays approaching, you can help support Washington State Health Advocacy Association! How? By spreading the word about AmazonSmile! ​What is AmazonSmile? AmazonSmile is a website operated by Amazon that lets customers enjoy the same wide selection of products, low prices, and convenient shopping features as on Amazon.com. The difference is that when customers shop on AmazonSmile (smile.amazon.com), the AmazonSmile Foundation will donate 0.5% of the price of eligible purchases to WASHAA. Many of us use already use Amazon for our shopping needs. I invite you to click on the following link and ensure you start at Amazon Smile, look for Washington State Health Advocacy Association, and begin your shopping experience there. Every little bit assists WASHAA on their goal to growing the organization, creating more valuable events and webinars, and spreading the word about Health Advocacy in WA State. Email us at info@washaa.org with any questions or concerns. Thank you in advance for your support! Top 5 Reasons to Attend If You Are A….. I recently spent almost five years engaging with the Patient Safety Movement across North America. The nonprofit with whom I worked not only initiated their own programs and services to improve patient safety but we also provided grants for the work of many others. At the end of that time I would describe myself as disappointed. I was not disappointed in the passion I felt when encountering patient safety advocates but rather in the entrenched resistance in many healthcare systems and the indifference of the general population, at least until the moment when they faced the possibility of medical errors or unsafe practices by their doctor or hospital. Add to that resistance and indifference the inability to find an adequate business model – be it for profit or nonprofit – to be a funded patient safety advocate and you get a picture of how bleak this field can feel to patient safety advocate insiders. In fact, the only bright spots I have seen have come from progressive healthcare providers able to present patient safety activities within the context of improving the financial bottom line. I believe what is needed in the U.S. are patient safety advocates who are independent from the very systems they wish to see change. It just isn’t enough to trust only in those nonprofits who, with patient safety as a strong focus, depend upon healthcare insurers, providers, societies or big pharma for their budgets. The risk of being coopted is just too great. An effective business model to achieve such independence is, I believe, the Achilles Heel of the Patient Safety Movement. This is where health advocacy can help the Patient Safety Movement. Health advocacy includes patient safety issues as a part of its mandate. Rather than that meaning patient safety issues get “watered down,” it provides a larger context for assisting patients by offering additional help needed by patients. Health advocates assist patients in medical, eldercare, insurance, legal and administrative areas regarding their long-term or acute care needs. Many health advocates do not provide all of what is in that list but the breadth of what they are able to cover is, I would argue, a more attractive service to patients and patient families than just patient safety. After all, most patients have the view that their doctor would be sure to keep them from any unintended harm, so why think about something – patient safety – their doctor already has covered? Of course, we know this is not true, otherwise how could more than 500,000 people die in U.S hospitals due to medical error every year? Just look at an August 2015 blog post about the 2014 record of 29 “never events” categories in Massachusetts hospitals: http://www.thepatientsafetyblog.org/2015/08/29-never-events-hospitals.html. There is more in health advocacy to commend it. Medical schools are already adding health advocacy to their course curriculum and it is possible to see a path forward that could make a career in service of this type much more potentially viable than what presently exists for patient-safety-only advocates. I say “potentially” because the health advocacy field is still facing the need for a bona fide credentialing platform, a universal set of core competencies, and an agreed reimbursement stream. Even with those currently missing elements, health advocates have a much better chance of a future successful professional environment than do patient safety advocates, in my estimation. Many hospitals have already begun to hire staff as Patient Navigators. But just as patient safety advocates can be coopted by healthcare systems that provide funding for their work, so too can Patient Navigators because the needs of patients are not always aligned with the needs of the healthcare system through which they are served. ​I hope it is clear that my purpose here is not to trash talk patient safety advocates but rather to suggest that there is a way for a win-win situation for these two important patient-related fields, where each field could be enriched. Many people I have met working in the field of patient safety are motivated because they themselves have suffered some kind of a loss due to medical error, sometimes grievously so, by losing a loved one in an untimely manner, because of errors. They strongly desire that no one else has to go through what they went through. But passion alone is seldom sufficient for a viable business plan. Are there challenges facing such a “marriage” of movements? Yes. But I believe it is time for a discussion. The health and safety of patients are principles deeply embedded in both movements. Let’s talk. It is not every day that you walk into a work meeting and discuss race - or white fragility (defined as the inability for white people to tolerate racial stress, preventing them from engaging constructively across race), but at a recent WASHAA meeting that is exactly how we started it. Led by Robin DiAngelo, our working group was challenged to consider how an absence of diverse experience, opinion and background leaves a gaping hole in whatever work is pursued. Her discussion provoked our thinking and shined a light on our own limitations and failings based on the environment we live and operate in. We all like to think of ourselves as anti-racist. But, I know as a white woman I cannot totally understand what it means to be another race. After listening to Robin DiAngelo, I would like to learn more and be engaged in trying to understand better and take action to support anti-racist living. The reality is most of us have a long way to go to taking action to really understand what 'inclusive,' and 'diverse' mean in everything we do. Our brief time with Robin DiAngelo sparked a lot of questions from our group: how do we go about including people from communities we don't know? Do we stop working on our program until we figure this out? What would it look like to invite and incorporate different needs and priorities from communities? Our working group discussed these questions and knowing that we, as a primarily white group have a lot of work to do. We will be contacting communities to see how we can engage in conversation about health advocacy and how we see and experience health advocacy challenges from differing points of view. If you are receiving this newsletter and want to join the conversation - please contact WASHAA at info@washaa.org. If you have suggestions about communities or people for us to talk with and/or people who want to join our efforts, we would love to hear from you! DiAngelo, is an expert on race relations and is the current Director of Equity for Senior Services, Seattle/King County. She has been a consultant and trainer for over 20 years on issues of racial and social justice.